Before it reaches the Tokamak's superconducting magnets, the electrical power from the 400 kV switchyard undergoes a cascade of transformations. 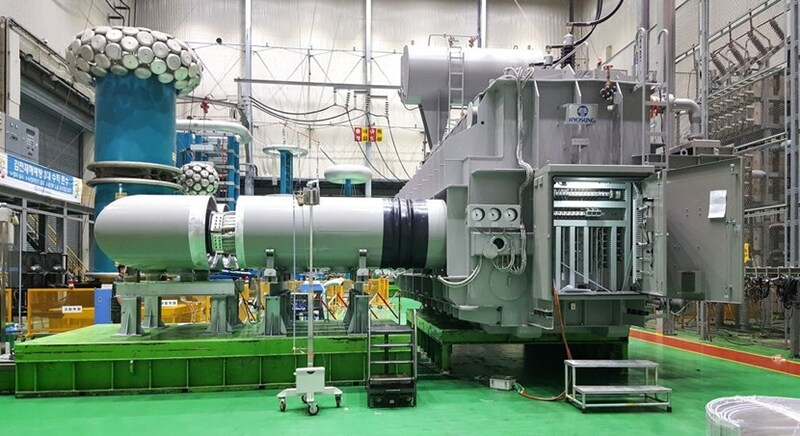 In July, the 130-tonne transformer (right) and the 4-metre-long busbar that connects it to the AC/DC converter were successfully tested at the Hyosung Factory in Changwon, Korea. The ''mushroom-like'' structures in the background belong to the high-tension testing equipment. First, three very large pulsed power electrical network transformers—situated adjacent to the switchyard—bring the voltage down from 400 kV to 66 kV and 22 kV. This reduced voltage is then fed to the converter transformers inside of the twin Magnet Power Conversion buildings. All 44 converter transformers are paired with large "rectifiers" whose function is to convert the 1 kV AC current into direct current (DC), just like an "adapter" for laptops or cell phones transforms the 110 or 220 volts from the AC current into 9, 12, or 24 volts of DC current. In July, the first of twelve transformers required for the central solenoid magnet system was successfully tested at the Hyosung Factory in Changwon, Korea, along with the set of high AC current busbars to connect it to the corresponding rectifier. Delivery to ITER can now be anticipated early next year. Six of the central solenoid transformers will need to be in place by First Plasma, while six others will be installed at a later phase.